This series of products displays the distributions of the main functional types of benthic and bentho-pelagic fish species derived from a multivariate analysis of eight life history traits. Four main living modes were identified as the ones described in the synthesis of Kindsvater et al. (2016). The first and second groups comprise small species with a short life cycle. Species from group one differ from those from group two by a reduced fecundity compensated by either internal incubation or benthic embryonic development that increase juvenile survival, whereas species from group two are characterised by higher fecundity and juvenile mortality (unattended pelagic eggs). By contrast, groups three and four comprise large and long-lived species. Species from these groups also differ in fecundity, higher in group three, and juvenile survival, higher in group four. Group four is exclusively composed of elasmobranchs (rays, squates and sharks) which either internally incubate a few offspring that they release as adult-miniatures or release large eggs in strongly protective cases fixed on the sea floor. Although these data products provide information on fish species community ecology, they also provide indication on ecosystem vulnerability through the distribution of the two last species groups given the time that these species require to achieve their life cycle, including reproductive success and trophic control; besides, many of these large species have an important commercial value. Average spatial group distributions are completed by sliding series of temporal windows restricted to three successive years in order to detect potential structural changes. Complementary maps display scores for each of the 37 trait modalities aggregated per spatial location. Additionally, one representative species of each group illustrates the functional typology. A typical species from the first group is the Snake Pipefish (Entelurus aequoreus). This small benthic species occurs on shallow shelf areas (10-100 m) among sea weeds and feeds on small crustaceans and fish larvae. During the reproductive season, the female insert her ova in the male brood pouch where they incubate until being released as advanced larval stage. Sexual maturation occurs at the age of two years and death at between three and five years. From the second group, the European Sprat (Sprattus sprattus), is a pelagic species feeding on small crustaceans, but its depth ubiquity makes it regularly caught by bottom trawls. It is a small and short-lived species, with an almost continuous reproductive period so that populations can be resilient to environmental variations and predation. Although the biomass displayes strong temporal variations, these type of species remain very important preys for many larger fish and birds. In the third group, the Common Ling (Molva molva) is a very large fish common on bottoms between 100 and 400 m deep. It lives up to fifteen years, but never matures before five years old as it requires a certain size to produce many eggs (several millions) of which only a few reach the juvenile fish stage depending on stochastic environmental conditions including egg predation. The Common Ling has an important ecological role since it is carnivorous and preys on several fish species, but also on large bottom invertebrates such as lobsters and cephalopods. 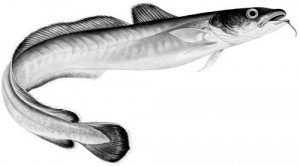 The Spiny Dogfish (Squalus acanthias), like the European Ling, is also a large carnivorous and long-lived species of shelf and slope areas, but it differs in its elasmobranch reproductive mode, characteristic of shark species from the fourth group. The Spiny Dogfish internally incubates a few offspring that they release as adult-miniature, which enables a better survival. However, the gestation of almost two years requires growing to a certain size and a very delayed maturity (10 years in males and 20 years in females), and a life span of hundred years to compensate for the reduced number of reproductions. The map below shows the data distribution of the four groups of fish. 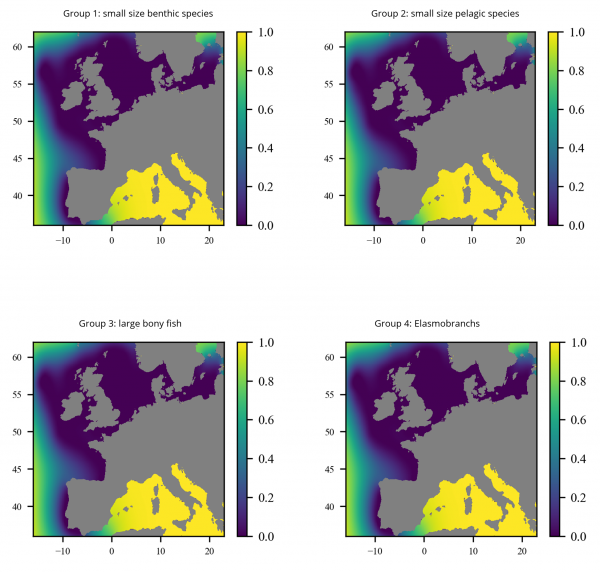 A DIVAnd interpolated map of the relative distribution of the four living modes, indicating that the areas with highest number of large bony fish species (group three) are around the English Channel and Celtic Sea, and for the elasmobranchs species (group four) the Bay of Biscay and the North Atlantic Ocean. Note that in some parts of the Bay of Biscay and the North Atlantic Ocean, the number of observations is limited (see above). Note that the relative error of this interpolation is quite large in the Mediterranean Sea, due to a lack of observations. 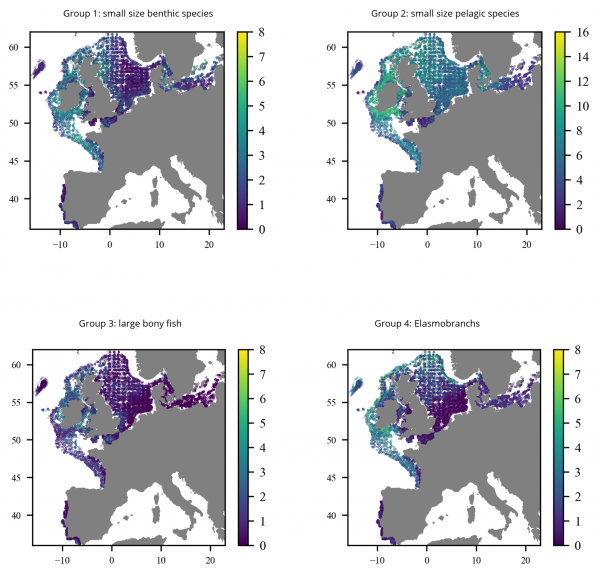 Species occurrences were selected in order to maximize the spatial extent over the European northwest shelf. Therefore, data older than the year 2000 were discarded since species lists were not completely reported in all regional protocols before that year. Some areas (e.g. north Spain) are still missing as the species lists are still partially reported. In other areas (e.g. Baltic Sea, Baltic International Trawl Survey), lists were completely opened only after 2010. The products provide the absolute and relative numbers of species of each functional group. True species richness may be underestimated as only a part of ichtyofauna is completely documented for biological traits, especially for values close to zero. However, the most documented species are also the most abundant and occurring ones, so that a good correlation between true and estimated values can be expected. Trait products are derived from the multiplication of the sample locations × taxa matrix by the taxa × trait modalities matrix explained in Beauchard et al. (2017) through the community weighted mean procedure (CWM). For a given community and within a trait, the modality score is the percentage of species expressing the considered modality; all modality scores within that trait sum to one. Finally, all the final outcomes were interpolated by the DIVA (Data-Interpolating Variational Analysis) tool to create gridded output maps.